(2011) The Babson Farm Quarry is one of my favorite places for painting inspiration on Cape Ann. Not only is the quarry mesmerizing in its location before the ocean beyond, it's surrounded by great hiking trails all around. Halibut Point State Park in its entirety is worth spending a day. 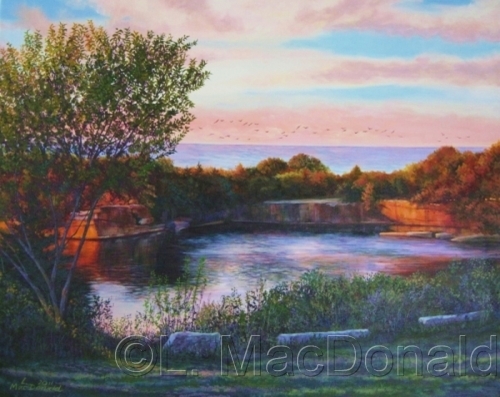 When my husband and I visited, the late afternoon sun on the granite quarry walls transformed them to a glowing burnt orange; a beautiful complement to the ocean blues and those reflected in the freshwater quarry. This painting was awarded the Founders Award as well as the Popular Vote Award in the Advanced Category at the 2011 Leominster Art Association's 46th Annual Spring Art Exhibition.